Whether you’re using a clinical trial patient recruitment company or creating ads in-house, your ad design can make or break your recruitment success. Katrina Ambrose, Antidote’s Senior Designer, Marketing, shared how she applies design thinking to clinical trial advertising. Before you start getting into the fun stuff like choosing fonts, imagery, and your favorite color, take time to understand your audience. Whether based in emotion or logic, advertisements are an appeal to your audience’s needs, wants, and expectations. While it may seem simple in theory, it can be deceptively difficult to design something that appeals to someone else, especially if it doesn’t appeal to you. The key to great design is to put yourself in your audience’s shoes. Research the challenges they face and design your ad to speak to one of those challenges. This type of research can be conducted on informational sites like Healthline, condition-specific patient advocacy groups such as JDRF, discussion boards, or on social media sites like Facebook. In your research, pay attention to the way your audience talks about their condition. Speak in their own language, be that verbal or visual, to build the type of trust and relevancy that will make your ad a success. For an ad to be effective, your audience should see themselves reflected in it. If you are using photography, try to match the subject and setting to the demographics of your audience. If your audience suffers from a visually recognizable condition it may make sense to include imagery of someone with that condition. Illustration can be a great alternative to photography as it can more easily span multiple demographics. Try not to be too clever or arty -- Illustration should be simple and comprehensible at a glance. Your imagery should reflect the goal of the study, as well. If you are proposing a solution, choose imagery that is positive and uplifting -- but be careful not to create ads that are too promissory, or they may be rejected by your IRB. If you are identifying a pain point, you might use imagery that is commiserative. Whatever you choose, a strong relationship between the copy and imagery will result in a more engaging story and a more effective ad. It is easy to fall into the trap of trying to make an ad do too much. For most ads you should limit yourself to an image, a short enticing headline, and a prominent call-to-action. The more details you include, the greater the cognitive load, and the longer it will take someone to decipher it. So keep it short and to the point, just like this tip. 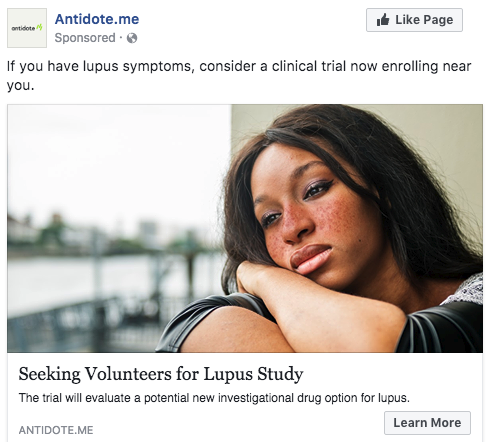 The goal for most clinical trial advertising is to entice prospects to click your ad to learn more about your trial. The way you achieve that is by presenting a clear call-to-action. It is important to have good visual contrast between the call-to-action and the background it sits on. This ensures the viewer’s eye is immediately drawn to it. You can create contrast using variation in color, size, or placement. Another good rule of thumb is to present the call-to-action as a button. People love to click buttons, even digital ones. Let’s assume you’ve used the above tips to create a highly effective ad with great imagery, a compelling story, and a prominent call-to-action. Now it is time to think about how that story is carried forward through the rest of the prospect’s journey. Have you ever clicked an ad only to have it take you to a page where the featured product is nowhere to be seen? Me too, and it is a terrible user experience. By repeating the same language and imagery across the journey you can reinforce your narrative and minimize the chance that prospects will feel confused or misled. With the right process, applying design thinking to your clinical trial advertising can be as simple as one, two, three … four … five. Learn how Antidote uses smart design and innovative targeting to reach the right patients, quickly and efficiently.